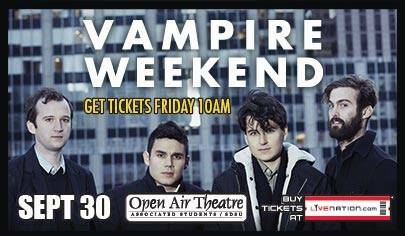 Vampire Weekend comes to San Diego in their 1st live tour in over 2 years! Tickets go on sale Friday at 10am but use KPRI as your password for presale tickets on Thursday from 10am-10pm. Tickets are $47.35 ($35 + $12.35 service fees). Touring in support of their critically acclaimed third album Modern Vampires Of The City, Vampire Weekend have added several more dates to their fall run. Along with previously announced headlining stops at Brooklyn's Barclay's Center and Los Angeles' Hollywood Bowl, the band have now announced stops at Philadelphia's Mann Center and Nashville's historic Ryman Auditorium, among others. The band will be supported by Sky Ferreira, Solange and Beirut on select dates. Vampire Weekend's Modern Vampires Of The City's critical acclaim has been matched by its reception with the public: it entered the U.S. album chart at #1, and has gone on to sell nearly 250,000 copies in the month since its May 14 release on XL Recordings. This is the second time Vampire Weekend has achieved such a landmark: Its sophomore album Contra also debuted at #1 in 2010, making Modern Vampires... the first time an independent rock band has entered at #1 with two consecutive releases.